Car guys and gals have probably received more than a questionable gifts over the years, so it might help to give the guy in the red suit a few pointers. For those who are into showing off their classic Cadillac or hot rod, many shoppers think they are picking the perfect present with one of those faceless creepy dolls to display at your next event; in reality, those faceless dolls are pure nightmare fuel. Instead of leaving friends and family to guess what would make a great gift, why not give them a few suggestions. As there are 12 days of Christmas according to the holiday song, it is fitting to feature 12 items that most gearheads would love to find under the tree. From practical to wild, these 12 suggestions may save you from an “As Seen On TV” Christmas. Santa seems to be powered by cookies and milk, but your vintage ride will require a different sort of fuel. Many classics feature original engines that rely on lead for protection, so VP Racing Fuels proudly offers their VP Vintage Leaded Fuel. With a 98 octane rating, this fuel offers protection for your engine along with a 2-year shelf life. As an accompanying gift, a VP fuel jug or Power Spout might do nicely. Getting your sled running requires an electric fuel pump that can keep the hungry beast satiated with plenty of fuel. 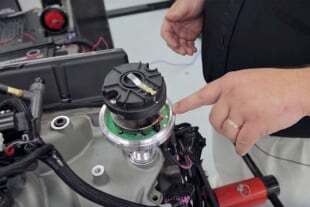 Aerospace Components offers the Ultra 350 Fuel Pump that can keep up with your thirsty hot rod. These pumps only can keep an 850-horsepower engine fed while only drawing only 9.5 amps. Transferring that fuel from the tank to carb, may involve a few AN fittings along the way. Oh what fun it is to change fuel lines in ’57 Chevrolet, when you have the correct tools for the job. Many of opt for the quality and beauty of AN fittings on their hot rod, but these fittings require the use of AN Hose end wrenches. So, a set of Russel Fitting AN Hose End Wrenches would be a great gift or stocking stuffer (depending on the strength of the hook and durability of the fabric). High performance parts are always a solid gift choice for gearheads; Blower Drive Systems (BDS) is happy to help Christmas wishes become a reality. It is hard to go to a hot rod show or competition event without running across a BDS blower. 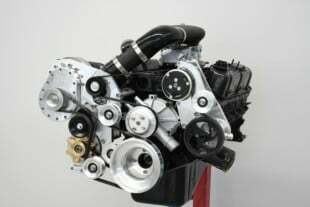 For those with 265 to 350 CID Chevrolet engines, then the Stage 1 671-Polished Blower Kit from BDS might be a perfect upgrade for your hot rod or street rod. For those hoping to find an upgrade underneath the tree this year, please tell Santa to make a stop at Scorpion Racing Products for a set of Endurance Series Rockers. Thanks to a low profile design, these rockers are able to fit underneath a “stock” valve cover. It is doubtful that hot rods owners are still using the original valve covers, but it is nice to know that this present will not require another purchase in order to make them fit. Just as Santa’s red suit keeps him warm and protected, your classic car deserves the best protection from the elements. Covercraft’s Fleeced Satin cover features a woven polyester shell complimented by an incredibly soft white nylon fleece under layer. This offering keeps both hot rods and classics free from dust in an indoor setting; it can be used as a light duty option for outdoor events as well. For those who are looking for a bit of adventure, it might be worthwhile to take a look at the Street Machine Nationals in St. Paul, Minnesota. A weekend event such as this would be a perfect opportunity to use that Covercraft’s Fleeced Satin car cover. With a spectacular display of show cars, shopping, and performance driving events the 2018 Street Machine Nationals might be ideal way to celebrate Christmas in July. Even though the cold weather may limit your hot rodding habit, it is important to maintain your battery over the dreary winter months. If Santa or one of his elves happens to leave an Optima Batteries Digital 1200 charger underneath your tree you and your hot rod will be very happy this winter. Some may dream of a white Christmas, but many classic car fans dream of a set of beautiful whitewall tires. Coker Tire offers a wide array of vintage inspired rubber for your classic, but a set of Classic Radial Whitewall tires will delight the hot rodder in your life. Speedway Motors offers plenty of gift options for the hot rod fanatic. If you have a T-bucket, street rod, or classic, then you need to take a few minutes to explore their website; currently they are offering free shipping on orders of $99 or more and plenty of other incentives. For those who are unsure of what to purchase or have no clue what they are trying to order, Speedway Motors offers gift cards. With a gift card, recipients can select the right parts for their product and avoid the return lines following the holiday season. In order to keep his sleigh shiny in the off season, Santa relies on Hot Rod™ Protective Detailer from Surf City Garage. This product does not leave streaks after use, it leaves a deep gloss and intense shine. This product is perfect for use at car shows, such as the Street Machine Nationals, or when you are tucking your T-Bucket away for the winter. All of the hard work and money that go into the creation or restoration of a classic vehicle needs to be protected. Alarms and antitheft devices are great ideas, but if the unthinkable were to happen, would your dream machine have adequate coverage? If a grinch were to abscond with your hot rod, collector car insurance can help ease the loss. Aside from grinches, there are bad drivers and natural phenomena to consider as well. Taking the time to speak with an insurance agent who specializes in collector cars is a worthwhile endeavor. The Triple C Agency is a great resource for those who are interested in protecting their collector car from the unknown.